Note: This story was originally published on Crosscut.com: In South Lake Union, Explosive Growth Is Just Getting Started. The transformation of South Lake Union over the last 15 years has been undeniably dramatic. The former low-lying industrial neighborhood has been replaced by mid-rise offices faster than anyone anticipated. Now, with nearly every block home to such buildings, it would be easy to think that the South Lake Union transformation is done, the new character of the neighborhood fixed. In fact, South Lake Union is about to enter another stage of transformation. For the first time, skyscrapers are coming. And they’re coming en masse. 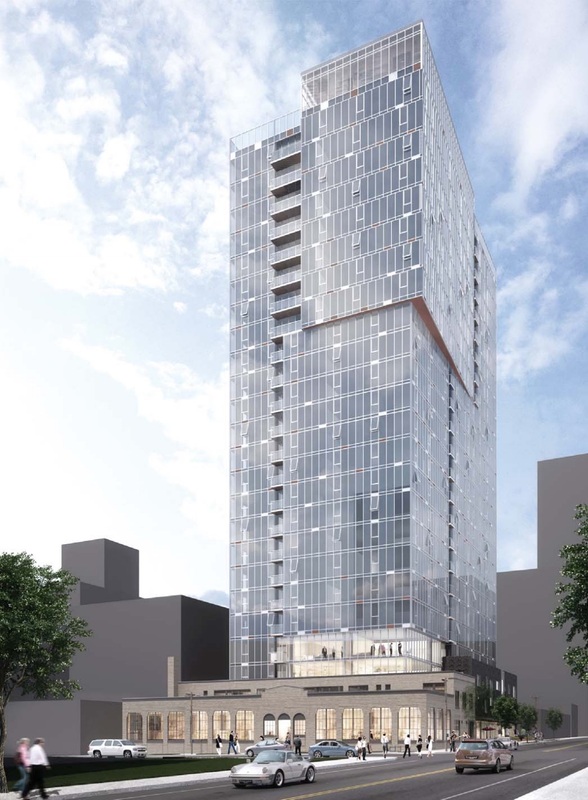 Two tower projects are already approved for construction: 25- and 26-story residential buildings a block apart on 9th Avenue. 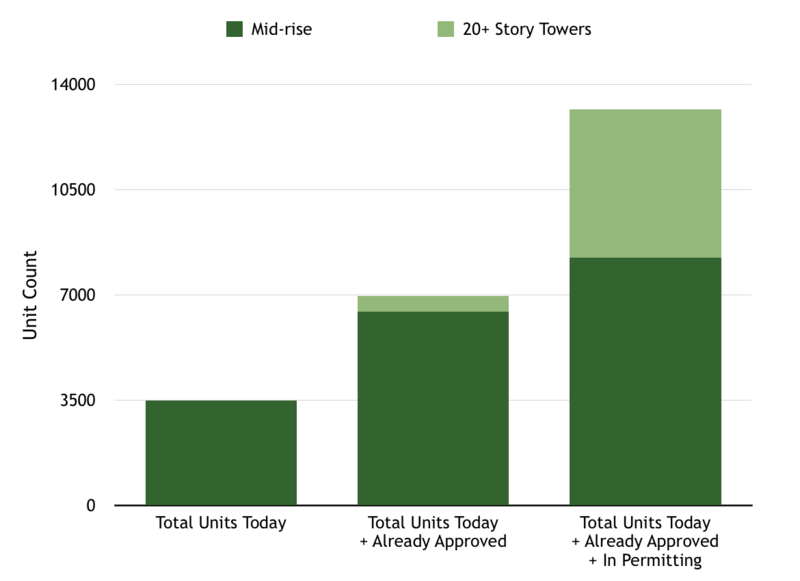 Another 11 towers are going through the permitting process, six of which are at least 40 stories tall. Permitting and construction will take several years, during which some projects may fall through and additional projects may be proposed. All told, if every one of the projects in the pipeline today reaches completion, there will be 13 new buildings, each over 20 stories, where today there are none over 12 stories. These new towers, all of them residential, will fundamentally alter the character and the function of South Lake Union yet again. Planned 20+ story residential projects. Click on the pins to see the permit descriptions, then click on the image to flip through the full design proposals. Throughout its recent boom, South Lake Union has been primarily a commercial neighborhood. Its approximately 3,500 units of housing are dwarfed by the estimated 35,000 jobs in the area. The new high-rise projects could bring nearly 5,000 new units of housing. Put another way, the population of just these new towers could be significantly larger than the current total population of South Lake Union. Another twenty or so mid-rise residential projects will add almost 5,000 more units to the total, meaning that in a few years South Lake Union could potentially nearly quadruple its residential population. Total housing units in South Lake Union. While the permits don’t show whether the developers plan for the projects to be apartments or condos, the recent trend has been almost exclusively apartment construction. If these trends persist, South Lake Union will be very much a rental market. With the rising residential population, South Lake Union will have to invest in appropriate amenities and infrastructure. The restaurant and bar scene will probably boom, with businesses able to take advantage of large lunch crowds and the fast-growing number of locals in the evening. But schools likely won’t be coming, as South Lake Union residents are overwhelmingly childless. The hardest part of the infrastructure challenge will be transportation. New office and residential projects together could add 15,000 parking spaces. How all those new drivers will get in and out of an already gridlocked neighborhood is unclear. Marginal improvements may come from more frequent and reliable public transit, but there’s nothing in the works that will fundamentally change the equation. Even the far-off Ballard to West Seattle light rail line being considered may bypass South Lake Union. Affordability will also remain a challenge. The concrete and steel construction of high rises is significantly more expensive than the wood frame construction used in low-rise and mid-rise housing, making it inevitable that the new towers will cater to the high end of the market. The affordable housing plan released this summer by the Mayor’s Housing Affordability and Livability Agenda commission (HALA) contains two main provisions for tying new development to affordable housing: a commercial linkage fee, which is a tax on new development used to fund non-profit developers, and mandatory inclusionary zoning, which requires developers to build a small percentage of affordable housing on site. But even if these proposals do eventually become law, they will come too late to affect the round of projects currently underway. The boom in South Lake Union residential construction is nevertheless likely a good thing for the affordability of the city as a whole. Without these new apartments, an additional 10,000 higher income households could be looking for housing in the existing neighborhoods, bidding up prices and pushing out lower income residents. In the mean time, the rapid pace of growth should give some urgency to City Council’s consideration of the affordable housing proposals currently before them.